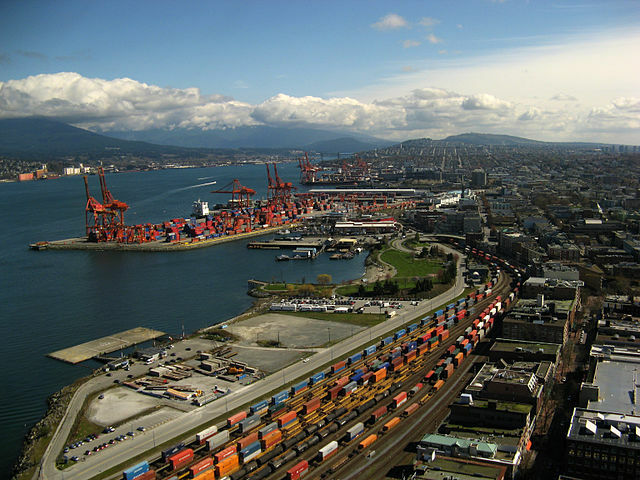 Canada's largest port, the Port of Vancouver. Canada placed 17th in the World Bank's Doing Business report that ranks countries by general ease of doing business. Canada ranks as the 17th easiest place in the world to do business in a report released on Tuesday by the World Bank. The 2013 edition of the Doing Business report rates 185 countries according to 11 sets of indicators that quantify the ease of complying with regulations and the protection of property ownership rights. Canada’s overall ranking was weighed down by the low scores it received in the ‘Dealing with construction permits’ (69), ‘Getting electricity’ (152), and ‘Enforcing contracts’ (62) categories. It ranked near the top of the rankings in the ‘Starting a business’ category, at third, with a business requiring one procedure and five days to start on average in the country. Last month, Canada placed fifth in another international economic freedom index, the Fraser Institute’s annual Economic Freedom of the World report. In that ranking, Canada placed well ahead of its southern neighbour, which came in 18th. The situation is reversed in the World Bank report, with the US, at 4th in the world, ranking 13 places ahead of Canada -exactly the same number of places that Canada was ahead of the US by in September’s report. The accuracy of economic freedom indices has been questioned by some groups, due to the arbitrary weighting of the indicators used to formulate the final score a country receives, and the non-recognition of the ease of participating in the un-regulated, informal economy – an area where less developed countries have an advantage due to their less developed regulatory enforcement mechanisms – as a factor in economic freedom in all of the major indices. Nevertheless, a good showing in an economic freedom index is highly sought after due to the perception it gives of a country being open for business and having a strong rule of law. Canada’s placing in the indices should improve considerably in coming years due to the comprehensive Red Tape Reduction Action Plan, a major overhaul of the regulatory framework, announced this month, which will implement the recommendations of the federal government’s year-long Red Tape Reduction Commission.